What is the real impact of globalisation on Australians’ approach to investing in equities? As digital technologies continue to reshape the investment landscape, we are seeing a change in how Australians invest and what they invest in. Australian investors have continued to increase their exposure to international shares. An example of this is seen in Australian investor ownership of shares listed on international exchanges, increasing from five per cent in 2014 to eight per cent in 2017. The Australian share market represents approximately 1.7 per cent of the total global market capitalisation. To put this into perspective, the overall market capitalisation of exchanges was $76.6 trillion USD as at the end of 2018. This is not to diminish the opportunities available domestically on the Australian Stock Exchange (ASX), but holding investments in international companies may provide exposures that are not available locally. Having multiple exposures in your investment portfolio has increased in importance due to its diversification benefits, wherein the spreading of unsystematic risk across the portfolio can enhance potential returns. Through an exchange-traded fund (ETF). Directly buying a single stock can be completed through a broker, which allows investors to buy and sell shares on major international exchanges, including the New York Stock Exchange and the London Stock Exchange. In contrast, a managed fund involves the pooling of funds with other investors, which is in turn managed by an investment manager. ETFs are a unique investment vehicle that encompass traits of both a single share and a managed fund; they can be bought and sold on a stock exchange like shares and typically contain a diversified portfolio of securities like a managed fund. 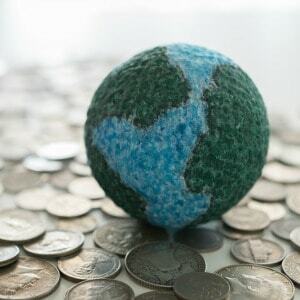 For many, ETFs are considered one of the most accessible investment vehicles to invest internationally due to their relatively low cost, limiting the loss of investment earnings to fees over time. Yet, the other major benefit of ETFs, diversification, is still often overlooked. Bottom-line, ETFs have democratized investing, being used by all types of investors by providing them with an accessible exposure to a variety of asset classes, sectors or countries. Why should we pay attention to international equities? Investing in international equities presents the benefit of accessing global industry leaders such as Microsoft, Apple, Amazon, Johnson & Johnson and Google. Some ETF products specifically track the investment results of multi-national, blue-chip companies of major importance, allowing investors to own a part of those companies that manufacture popular household brands. 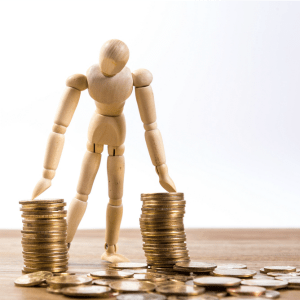 For some investors, holding blue-chip companies creates a sense of comfort, primarily due to their association to quality – characterised by stable cash flows and long-term profitability. 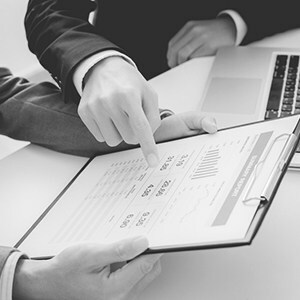 With low fees, ETFs provide a cost-effective way of accessing this broad group of securities through a single vehicle without having to purchase the underlying constituents individually. Within equities alone, diversification benefits are abundant through varied exposures across countries and sectors. A consequence of Australian investors’ traditional home bias means many Australians are exposed to under two per cent of the world’s total share market. In addition, Australia’s high level of concentration risk in the financials and materials sectors makes the Australian equity portion of investor portfolios much more vulnerable to a sector-specific downturn. 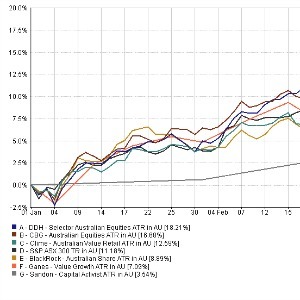 As depicted in chart one, it is evident that an Australian equity profile is great if you’re building a portfolio that’s heavily weighted to the financials and materials sectors. However, for exposure to the technology and healthcare industries, it barely scratches the surface. 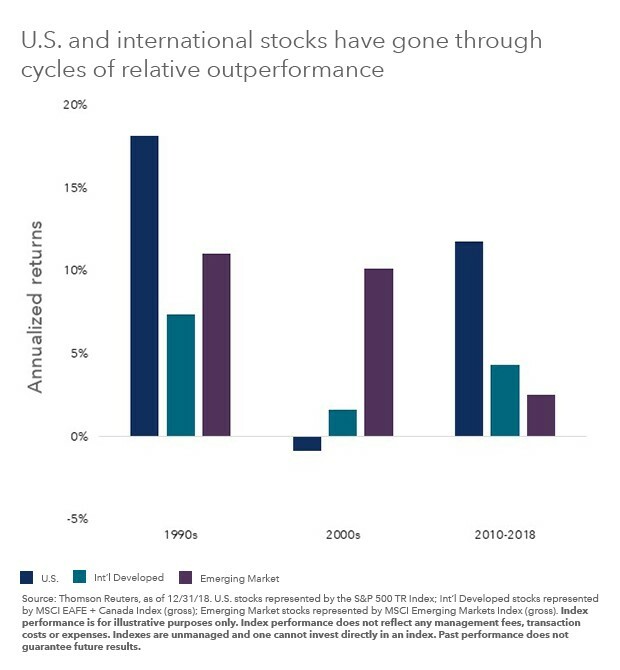 Having a healthy dose of international equities in a portfolio can reduce concentration risk not only across countries, but also sectors, as the impact of idiosyncratic risks on the overall returns of the portfolio are reduced. There is no certainty for one economy to outperform another for any given period. The volatility during Q4 2018 brought fear amongst investors globally, alluding to rising concerns of another US recession. Risks such as escalating US-China trade tensions and a more hawkish stance by the US Federal Reserve also dampened investor sentiment, whilst local events, such as the current house price correction, look to potentially impede Australian economic growth in 2019. Countries are therefore primarily exposed to their own country-specific risk but are implicitly exposed to the idiosyncratic risk of other economies as well. Indeed, over the long run Australian stocks have historically seen positive levels of returns, however this has certainly been the case for any given period. It is imperative to look past the home bias as other international markets can outperform for any given period, as indicated in chart two. This has been seen most recently in emerging countries, wherein infrastructure developments and a growing middle class have brought accelerated rates of growt. A well-diversified portfolio across multiple countries and sectors can expose your investments to different rates of growth, with some ETF products also providing exposure to the emerging market. An additional consideration that comes with investing in international equities is the impact of changes in currency values relative to the AUD. Seen through the ever-shifting lens of foreign exchange, earnings from global companies can conversely appear much less rewarding or reliable for Australian investors, adversely impacting the overall returns of an investor’s portfolio. For example, an investment in an ETF focused on US securities (e.g. ASX: IVV) will give the investor exposure to the currency these securities are denominated in, that being the US Dollar. Currencies will constantly fluctuate, and in this case, if the AUD depreciated relative to the USD, the value of the ETF will rise, and the converse would occur if the AUD were to appreciate relative to the USD. A hedged version of an investment with international exposure can be a way to mitigate the impact of fluctuations in currencies on investment returns. If the AUD were to appreciate relative to the USD as above, the value of US securities would see diminished returns. However, a hedged ETF will minimize this currency impact by isolating exposure to equity markets and eliminating currency volatility. While it is common to have a home bias and be overweight in domestic investments, it is important to consider the abundance of dynamic investment opportunities globally which are currently untapped by Australian investors, yet accessible on the ASX. The ability to access market leading companies, different sectors and multiple countries of varying rates of growth have proved to be beneficial for diversification purposes, given the high level of concentration risk for Australian investments. ETFs present a highly accessible investment vehicle that are low cost and can be used to access these international equities. Christian Obrist is the head of iShares, BlackRock Australasia.